After years of construction, the end is in sight for the final stage of the project on I-95 in Needham, Massachusetts. After decades of promises to add a lane to Interstate 95, with work finally getting underway in 2003, the last stage of major construction around Route 9 and Highland Avenue is on track to wrap up in 2019. And after years of detours, traffic jams, and close calls, that's a bit of good news. "It's pathetic. How long's it going to last? It's been going on forever," one driver said Wednesday afternoon at a gas station on Highland Avenue in Needham. Drivers are frustrated by the years of highway construction. "I don’t think it's enough," said another driver. "It's just like the Big Dig. Halfway through the project, it was obsolete already." "It's very horrible because you get into 128 and everybody’s coming across in the breakdown lane and you no see them, and you have a head-on collision," said a third. One of the biggest projects was widening I-95 south of the Massachusetts Turnpike to four lanes. A lot of commuters know the last phase is underway now in Needham and Wellesley. The work there is on schedule, but over budget. 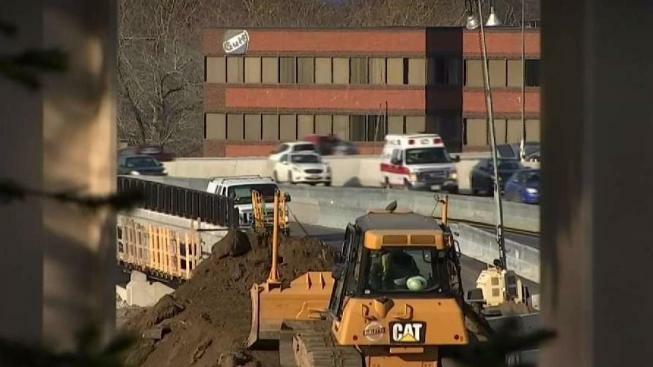 In 2015, MassDOT said it would take four years and cost just under $140 million for a major rebuilding of the Interstate between Route 9 in Wellesley and Kendrick Street in Needham. Six new bridges, a brand new exit, an additional travel lane in each direction. MassDOT now says it expects the job to cost about $150 million. Construction is still scheduled to wrap up by 2019. Major milestones have been met. Earlier this month, the new exit at Kendrick Street opened in Needham. Crews are working on upgraded ramps to and from Route 9 while finishing a major new bridge. Officials first promised to widen I-95 in 1985, at $50 million over five years. The price tag ballooned by the time the project was ready to get off the ground more than 15 years later. Overall, MassDOT said widening I-95 will cost $350 million when it's all said and done.